Features: Large structure featuring climbing rainbow ladder, two slides, bridge, climbing tunnel, see saw, inverted v climber. Several baby swings and adult swings. Tire swing. Surrounding Park Area: Some greenspace with benches and picnic tables. All shaded! There is a small trail that goes to more greenspace on the north side of the park. Shade: Yes! Lots of shade! The entire play area is shaded!! Seating: Several benches and a wall that surrounds the playground that parents can sit. Stroller/Wheelchair Access: Yes, stroller access is available. Safety: No particular hazards noted. The spokes on the rainbow climbing ladder seem to be further apart than some other playgrounds, so spotting may be necessary for the little ones. Cons: I love the shade, but shade brings mosquitos. Bring your bug spray! Overall Assessment: This is a wonderful and very popular playground tucked away in Morningside. There are always kids running around and parents/nannies to talk to. One thing that my son really enjoyed (who is 2) is running around the play area. There is a trail that is on an incline that you can go around the play structures and then down some stairs….he played chase with several children on our outing doing this many many times. Lovely playground! 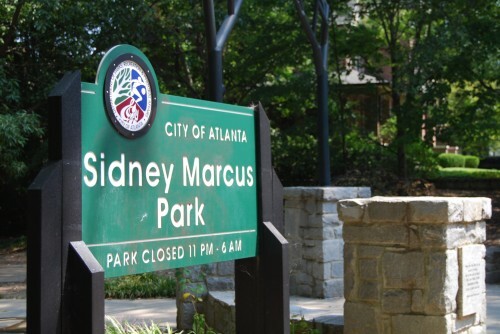 On a side note, Sidney Marcus was a Georgia legislator from Atlanta and served in the Georgia General Assembly from 1968-1983. One of his major accomplishments included helping to stop the I-485 freeway which threatened several intown neighborhoods. This is actually what lead to naming this particular park in his honor.